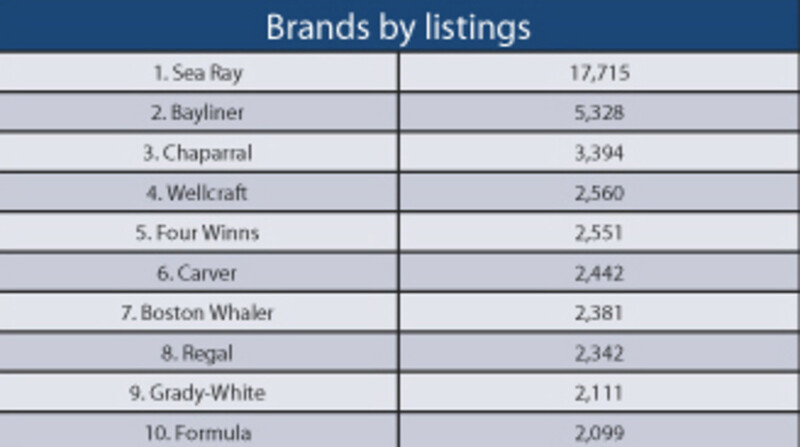 Last month, we reported about the most-searched brands on Boat Trader. This month, we look at the other side of the coin — the brands with the most listings, specifically as used boats. This inventory snapshot was taken for the 12-month period that ended March 31. Sea Ray, the most prolific production brand for many years, leads the ranking with more than three times the listings of second-ranked Bayliner. Chaparral, at No. 3, trails Bayliner by nearly 2,000 boats, but still substantially leads the tighter group of brands that round out the top 10, from Wellcraft at 2,560 to Formula at 2,099. Four of the 10 most-searched brands don’t appear on this list — Ranger (No. 4), Mastercraft (No. 6), Yamaha (No. 9) and Malibu (No. 10) — but they are all in the top 25 in terms of inventory.